← You’ve been waiting for this, haven’t you? 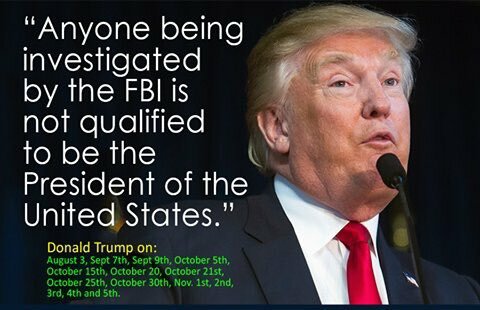 But he was unqualified to be president regardless of any investigation, so the FBI investigation shouldn’t have any impact. That was before the FBI was rigged. Yeah, but you only ask for immunity if you’ve committed a crime. So there! I’ve been smiling all day about Billy the Kid whose show has now lost about 21 major advertisers. Silly Billy and Model T. are of the same caliber. Rights of women and respecting women is not in their vocabulary. Narcissistic personalities never believe they are wrong. At least as far as I know. They have little to no scruples and no conscience. In spite of 3 million fraudulent votes! He is many fitting quotes from the campaign. Oh, did you hear Bannon’s off the NSC? Why would a malignant narcissist ever admit that anything was a mistake? Silly girl! Silly me. He’s now defending O’Reilly too. Because obviously the women were asking for it.